In a pre-season game where both clubs held out a majority of the players truly contending for roster spots, the Calgary Flames and Edmonton Oilers put on a decent showing. More importantly from an Oilers perspective, a few players stood out in both good and bad ways. Now, it’s hard to have sound judgment after just one pre-season game. In reality, it’s not fair to get a real talent assessment based off one game. However, stringing a few good games together goes a long way in getting a decent look in camp. After a few more of these, we’ll get a separation between the contenders and pretenders when it comes to Edmonton’s 23-man opening night roster. The Oilers walked away with a 7-4 victory over the Flames and will look to build upon that success in their second pre-season game against the Vancouver Canucks. * Luke Esposito rotated in on the fourth-line with Cameron Hebig. 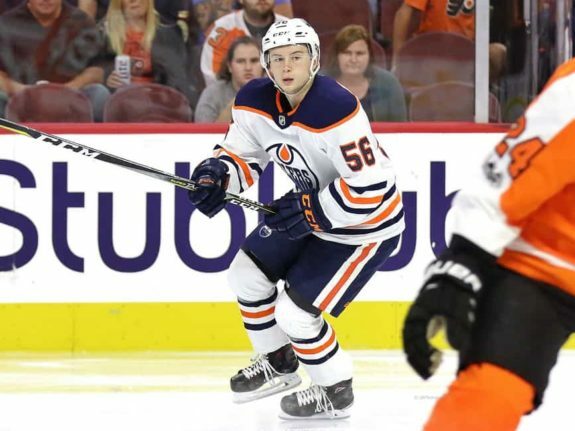 Here are some takeaways from Edmonton’s first pre-season game. Remember, take everything with a grain of salt, it’s been just one pre-season game, and we can’t stress that enough. We don’t want to get into a spot where we’re hoping previous camp standouts like J-F Jacques, Braden Christoffer, or even Vladimir Tkachev are here to save the day come regular season time, do we? Here’s what we learned after Game One. To say Koskinen’s Oiler debut was underwhelming is, well, an understatement. As prefaced, it’s one game, but the 31-year-old was flat out abysmal. Flames prospect Dillon Dube potted a hat trick just over 24 minutes into the game, including the first of the game only 36 seconds into the action. All in all, the towering Finnish goaltender allowed three goals on 19 shots and finished the night with a .842 save percentage (SV%). One game, sure, but looking at the 40 minutes he played, he didn’t provide quality minutes. The trio of goals by Dube snuck through Koskinen, and all the weaknesses from his scouting report were visible. Poor rebound control, difficulty reading and reacting to plays, out of position, and as mentioned, allow pucks to squeak through him. It’s one game, and you can’t get too high or too low in pre-season, but if this happens in his next two outings, a problem could be brewing. 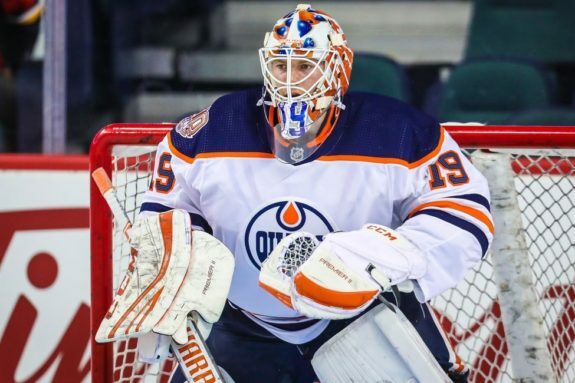 Koskinen was signed to an expensive one-year deal for a backup goalie at $2.5 million with the expectation he’d push Cam Talbot for minutes in the Oilers crease. While we’re not writing him off after just 40 minutes of play, Koskinen can ill-afford to have another handful of pre-season showings with this level of play. This signing has been heavily questioned throughout the summer, and the jury is still out on a guy who spent the last seven years playing in Europe. The tale of the tape gives a comparison very similar to another former Oilers backup; Anders Nilsson. His performance didn’t yield a lot of confidence, but to play devil’s advocate, we’re talking about a guy that is in the early stages of adjusting to the North American game. Expect to see Koskinen get thrown back out to establish himself, get rid of the jitters, and settle into his role as the No. 2. It’s not the time to panic, it’s been one game, in pre-season folks. Edmonton’s first-round pick (22nd overall) from 2017 had a quiet rookie camp but had an impressive showing in his first pre-season game. The soon-to-be 20-year-old put up two goals and three points in 17:39 in ice-time. He looked sharp and was dealt the most power play (PP) minutes (4:32) alongside linemates Ryan McLeod and Tyler Benson. The only other forwards who played more were Ryan McLeod (22:21), Alex Chiasson (19:00), Benson (17:56), and Pontus Aberg (17:49). Yamamoto delivered on his chances, tied Patrick Russell with the most shots on goal (three), and made his presence felt. With a motor that doesn’t quit, Edmonton’s top forward prospect was heavily involved in all plays. Whether it was digging in the corners and coming out with the puck, or sneaking past the Flames defenders on his breakaway goal, Yamamoto stood out in a big way. One scenario that stood out was him having the vision to grab a loose puck below the goal line and fire the puck to the point on Ethan Bear’s goal while Calgary was still trying to find it. The real question now is whether or not he can keep it up and will his way onto the opening night roster. He did it last year, and he can do it again this year too. Keep an eye on him as the intensity in the games picks up. Chiasson was the only one of the three skaters on professional tryouts (PTO’s) to play against the Flames. 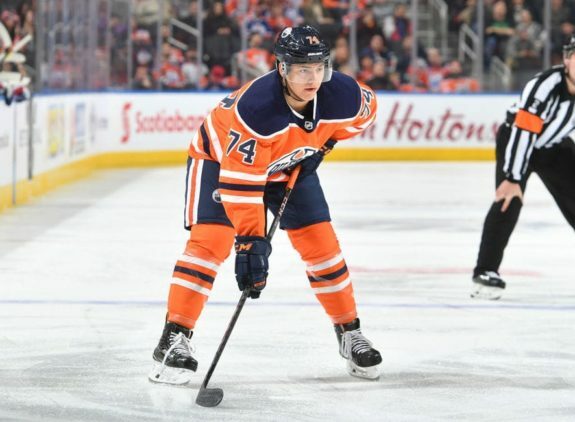 It was a mixed bag of results, and you can’t say he didn’t get a fair shake while rotating through the top-six and playing the second-most minutes amongst Oiler forwards. 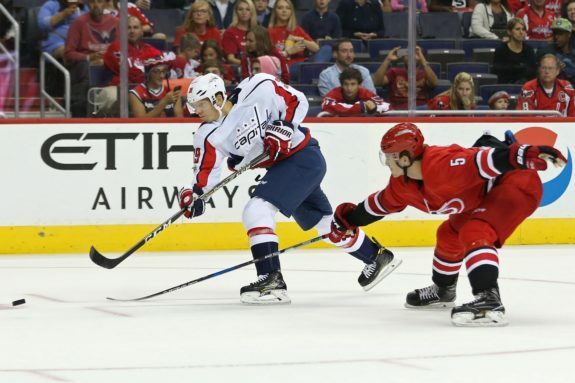 He registered two assists while skating alongside Russell and Brad Malone. Edmonton also gave him an extended look on both special teams. The 27-year-old picked up both points in the final three minutes of the game. There was some good, but not a whole lot to write home about regarding Chiasson’s showing. It was a middling performance overall. He had some difficulty getting to pucks, wasn’t overly effective on the forecheck, and it wasn’t until the final period that he stood out. He’ll have to be better if he wants to stand out and force his way past Pontus Aberg, Drake Caggiula, and Zack Kassian. Evan Bouchard had a decent showing scoring the first goal of the game for the Oilers, and leading all Edmonton defenders in ice-time (24:31). Alongside Ethan Bear (4:56), he was heavily utilized on the PP (4:29). His decision-making is still adjusting, and some of his reads on when and when not to join the rush or pinch are still a work in progress. That said, he moved up and down the ice efficiently, and didn’t look out of place at all. He was one of Edmonton’s biggest standouts. Bear, 21, is returning for his second pro season and has an outside shot at the No. 6 job. There’s a handful of candidates vying for that No. 6-7 spot, and while he did play a lot (21:45), he could’ve been better defensively against an AHL-calibre lineup. Some poor reads, and running around in his own zone are things that need to be cleaned up in his game. Offensively, he’s one of the best blue line prospects in the system next to Bouchard. Logan Day didn’t get on the scoresheet, but his ability to make heads-up plays in the offensive zone stood out. He won’t be anywhere near contention for an NHL job (he’s on an AHL deal), but he might surprise down in Bakersfield. Kevin Gravel meanwhile might’ve been the most underrated player who quietly went about having a great showing. This summer’s free agent signing was reasonably good in his own zone, made a ton of safe but effective plays getting the puck up ice, and asserted himself physically. It’s not hard to envision him as the No. 7 for Edmonton this season. McLeod was impressive and showed alongside that kid line with Benson and Yamamoto that he might not be far off from competing for an NHL job. It might not be in the cards for 2018-19, but he’s been a joy to watch through the summer. Expect McLeod to get into another game or two before being re-assigned to the OHL’s Mississauga Steelheads. Have any thoughts or takeaways from the first pre-season game? Let us know in the comment section below.